Since we’re talking about the topic of books on the subject of the prophetic, I thought it would be worthwhile to ask Brad Herman his recommended books on this topic. He humbly asserted that he himself was not necessarily wired prophetically—nonetheless, he could point me in the direction of books that others have spoken highly of. Brad is the owner of The Arsenal Bookstore based in Colorado Springs. I met Brad back in 2004 and I have tried as much as possible to purchase my books through his website in order to support a business that is definitely a Christ-centered enterprise. The bookstore was initially founded by Peter Wagner and it continues to sell books at conferences hosted by Wagner’s ministry. 1. Understanding Prophetic People: Blessings and Problems with the Prophetic Gift by R. Loren Sandford - This book is a sound look at the character development that prophetic people will go through. This is one of the most well rounded books that would be good for someone who wants to understand the gift of prophet. Sandford does a great job of exposing the excesses. 2. 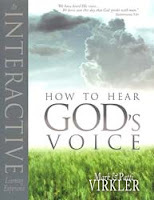 How to Hear God’s Voice by Mark Virkler - Prophetic or not, every believer should read this workbook. This book is a classic that has helped many of today’s top prophetic people get their start. It is a sound, practical approach to hearing the voice of God. 3. The Seer: The Prophetic Power of Visions, Dreams, and Open Heavens by James Goll - For those who have open visions or are Seers, this is a good book that will help them understand their gifting. Personally I have only read Jim Goll's The Seer in its entirety, which I thoroughly enjoyed and found useful. Jim applies an exhaustive biblical study on this seer dimension that I am comfortable with—whereas, some other prophetic voices out there tend to gravitate towards “techniques” that are questionable. All prophetic activity stems from an intimate relationship with the Godhead—namely, the Father, the Son, and the Holy Spirit. Techniques can never substitute for an authentic pursuit of the hidden life that is found in the secret place in Christ. On the basis of His ongoing pursuit of us, we must pursue the deep things of His heart through the crux of the Cross. May your heart be stirred right now even as you read this to pursue the One who has pursued you! May your inner man desperately long for greater revelation of His great worth, His great splendor! But I definitely will be looking into reading some of those at some point, as I'm sure Jet will too.